Have you ever wondered how we come up with our movie choices here at Food 'n Flix? The answer is simple—our hosts choose them! Whether you've hosted in the past or want to host for the first time, now is the time to sign up for 2017. If you'd like to be a host...or think you'd like to be a host...please take a few moments to read our HOSTING RULES PAGE. Rules have recently been updated, so even if you'd hosted in the past, head on over to see what will be expected of you going forward. Confirmation that you have read and agree to the hosting rules. The month* that you'd like to host (check out the schedule first to be sure that month isn't already taken). Your movie choice IF you know it. It's okay if you don't know what movie you'd like to host with right away, but you will need to let me know at least 2 full months before the month you are hosting (so, if you are hosting in October, I will need your choice no later than July 31). Feel free to ask any questions that you may have. Don't delay because our hosting spots fill up fast! Don't forget to like and follow Food 'n Flix on Facebook and Twitter for important updates and to see what everybody is making throughout each month. 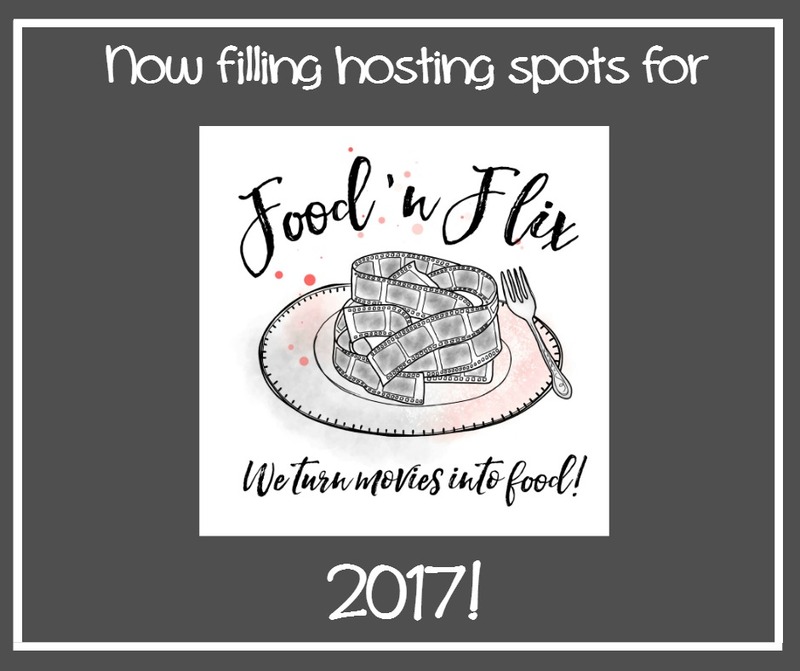 Update: If you've never joined us for a month of Food 'n Flix before, I welcome you to the club and am happy to let you host on the condition that you plan on joining in at least a couple of times before the month you choose to host. This will benefit you greatly, allowing you to see how everything works and also become acquainted with the other bloggers! *Only one month per blog at this time. Hi Heather. I have read and agree to abide by the rules. I can take March. I will let you know my movie choice by January. I have read and agree to abide by the rules. Of course I will host again! Can I have June? OK---just emailed you but I will take August! To Kill a Mockingbird.